I would like to thank all of our clients for supporting us last year. We look forward to helping you look after your animals this year too. Thank you very much for your patronage. Ontario was the rabies Capital of the world during the late 80’s and early 90’s. Then, due to organized rabies vaccination programs by the health units and baiting projects by the Ministry of Natural Resources the problem was wrestled under control. Of course, once controlled these efforts were relaxed and now, once again, rabies is back in the news. As of December 18th, there have been six confirmed cases of racoon rabies in the Hamilton area. Last week, one of our clients in Perth County had a heifer confirmed rabies positive. Family members are being inoculated. So, rabies is becoming a problem again! A: Rabies is a viral disease transmitted through the saliva or tissues in the nervous system from one infected mammal to another. Rabies can be transmitted from a wild animal, such as a bat or racoon, to a dog, cat or human, and from pets to humans. The virus attacks the central nervous system causing severely distressing neurological symptoms before causing the victim to die. Rabies is one of the deadliest diseases on earth, with a 99.9 per cent fatality rate. For detailed information about rabies visit omafra.gov.on.ca and type in the search “rabies in Ontario”. Q2: Does my pet have to be vaccinated against rabies? A: Yes. Dogs and cats over 3 months of age must have either a current Certificate of Vaccination or a current Statement of Exemption issued by a veterinarian for that animal. Unvaccinated animals are a risk to human health, and owners of unvaccinated animals can be subject to fines of over $90 per animal. Q3: What happens to unvaccinated animals that come into contact with rabid animals? A: Once signs of rabies appear, the disease is virtually always fatal. The incubation period for rabies in dogs and cats can be up to six months. If your animal is unvaccinated and comes into contact with a rabid animal, it may need to be confined for up to six months. If in that time your pet contracts rabies, the only option is euthanasia as your pet would die from the disease within 7-10 days. Q4: What happens to unvaccinated animals that bite a person? A: Any domestic animal that bites a person should be reported to the local public health unit. The animal will be placed under a 10-day (dogs and cats) or 14-day (most other domestic animals) observation period. If the animal does not display any clinical signs of rabies by the end of this period, then the risk that it could have been shedding the rabies virus in its saliva when the bite occurred is negligible. Washing any wound immediately after exposure to animal saliva can greatly reduce the risk of infection. After exposure, the local Public Health Unit should be contacted to determine risk of exposure. Q5: How many cases of rabies have been reported in Ontario? A: The Canadian Food Inspection Agency (CFIA) provides a listing of positive rabies cases reported by species in each province, each year. To view a list of reported cases go to: inspection.gc.ca and type in the search “rabies in Canada”. Q6: Where can I get my pet vaccinated? 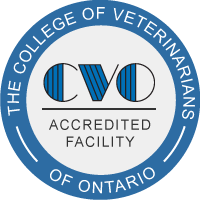 A: Rabies vaccinations are available from any accredited veterinary practice in Ontario. Before administering the vaccination, your veterinarian will conduct a physical examination of your pet to ensure that he or she is healthy enough to be vaccinated. The examination also allows your veterinarian to identify any concerns about your pet’s health and treat them before they become serious and costly illnesses. Learn more about basic pet care at ovma.org/pet-owners. Q7: How long does the rabies vaccine last? A: Rabies vaccinations protect your pet for one to three years, depending on the vaccine used. Talk to your veterinarian about the vaccine that’s best for your pet. Q8: Is the rabies vaccine safe? A: Some animals may experience adverse reactions to the rabies vaccine, ranging from minor to severe. You should discuss your animal’s risk, health and any prior reactions your animal has had to vaccines and medications with your veterinarian to determine if they can be safely vaccinated. Animals should be monitored for reactions after they are vaccinated and in consultation with your veterinarian. Veterinarians can call the OMAFRA Agricultural Contact Centre: 1-877-424-1300 for assistance. If you can’t remember when you dog or cats were vaccinated then call the office. We keep that information on our records.